Original Content: Why Can't I Shop In Both Places? A Facebook friend linked to an old Slate article called Don't Support Your Local Bookseller. It has the kind of title guaranteed to attract irate readers. The good point the author makes is one that I find few people want to discuss--the cost of books. There are people who truly can't afford to buy much in the way of full-price, hard cover books or even your classier paperbacks. Your really serious readers need to get their hands on a lot of books. How many of those people can support a local bookseller for all their reading needs? Making books available at more affordable prices and whenever readers want to buy them, as Amazon and Barnes & Noble do, makes books more available. It encourages the sale of books, and it encourages reading. Having said that, I did have a great independent bookstore experience while on retreat last week. Our cross-country ski spot was suffering from weather shock--too warm and too rainy. Trails were closed almost all week, and we never took our skis out of the car. I was worried about running out of reading material, which was ridiculous because I always overpack books and magazines. 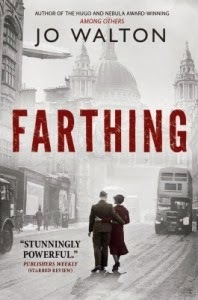 So we wandered down the mountain to Bear Pond Books, where I browsed and, yes, stumbled upon what was a perfect book match for me, Jo Walton's Farthing. I'd never heard of Walton, and I believe I'd never read an alternative history story. But what this book does is mash together the mid-twentieth century British Scotland Yard detective story, along with the British country estate story, and the British World War II story, all of which I've been known to enjoy over the years, and puts them into that alternative history world. This was kind of a custom made book for me, and it is unlikely I would have found it on Amazon. Farthing is the first in a three-book series, and I'm interested in picking up the others. Is that great for that author? Yes. Is it great for her publisher? I hope so. And, yes, it's because of the classic independent bookstore experience. But you know what? I may end up getting them through Amazon. And not just because I can get them cheaper there and may decide to purchase them for my Kindle. An equally important reason is that I have to go quite a way to find an independent bookstore. That one I visited during retreat week? It's five hours from here. Limiting myself to independent bookstores means limiting book purchases, both because of price and because those stores are few and far between in these parts. Good independent bookstores provide a wonderful shopping experience for readers. But let's face reality. Amazon provides a good, though different, shopping experience, too. If an independent store is good, it's as if you're wandering around someone's personal collection of books, rather than displays of what's being buzzed about right now. Which is why I sometimes stumble upon something at those places. They really do seem different from Amazon and the B&N stores. But I've been in indies that were pushing the same old, same old, too, or were half gift shops so that there wasn't enough book stock to make browsing worthwhile. I like your balanced, realistic perspective on this, Gail. My husband and I wandered into an independent bookstore right before Christmas, when we were early for a dinner reservation in San Francisco. I discovered a new book by an author that I enjoyed, that I hadn't known about, and various others, and left with a big bag of books. But I also thumbed through some books that I plan to get on my Kindle, because I don't need to have physical copies to keep, and there's a $ and convenience factor. I do try to buy things whenever I am in an independent bookstore (or B&N, for that matter, because I don't really want them to go out of business either). But on a day to day basis, when I want something right away, and I don't want to leave the comfort of my own house ... Amazon is pretty nice. "But on a day to day basis, when I want something right away, and I don't want to leave the comfort of my own house ... Amazon is pretty nice" And we are still supporting authors and publishers when we shop on Amazon. I just ordered the next book in the Farthing series for my Kindle so I can start reading it tonight. In a few minutes, in fact. It could be weeks before I can get to even a Barnes & Noble (I agree--not good if that chain goes under. ), and I don't know if the book I just bought would be on the shelf there. I agree - that's why I shop at Powells rather than our closer indy - ours like a frou-frou Barnes & Nobel. More frou-frou than just a coffee bar, with the literary action figures, embroidered pillows and tchotchkes all over. I rarely find anything, and often feel frustrated, because aren't I supposed to be preferring them? You make some really good points about something I obsess over, and I think I'm going to stop being ridiculous about Amazon more often. You know you can order online from most any indie bookseller. So if the problem is that they're 5 hours away, just check out their website.